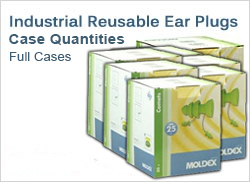 Industrial Reusable Ear Plugs in Cases, Best Pricing! How do I choose the right reusable ear plug for me? No two person's ears are exactly the same, so to some extent, finding the right reusable ear plug for your unique ears will probably involve some trial and error. With reusable ear plugs, size is a critical factor in finding the right fit -- and some reusable ear plugs come in multiple sizes for just this reason. If you know you have small ear canals, look for a small size; if you know you have large ear canals, try a large size. Of course, if you do not know what size your ear canals are (and most people don't), you will simply need to try a pair of ear plugs, evaluate the fit for yourself, and go from there. After fit, NRR (Noise Reduction Rating) is the most important factor to consider when choosing the right reusable ear plug. The higher the NRR, the more noise protection the plug will provide. You should choose appropriate noise protection for your environment; maximum protection is not always the ideal choice if you're dealing with a mild-to-moderate noise environment, or need auditory situational awareness for safety reasons. After size/fit and NRR, then consider any other factors that may be important to you, such as whether the ear plugs are corded/uncorded, whether they come with a carry case, and what color they are. How do I know whether my reusable ear plugs fit correctly? First off, do not ever force your ear plugs into your ears! Gentle pressure and a little rotation of the ear plug is all it takes to insert a reusable ear plug; if you experience any pain, stop immediately -- you're pushing too hard, the ear plug is too large, or both! You can tell that your reusable ear plugs do fit correctly, and are being worn properly, when they form a complete acoustic seal all the way around the ear canal. If the ear plug does not firmly touch the entire perimeter of your ear canal, or if the ear plug feels loose and falls out easily, that particular reusable ear plug is too small for your ears. A properly fitted reusable ear plug will provide a good acoustic seal, will not fall out when you tilt and shake your head, and will not hurt your ears. What's the difference between industrial reusable ear plugs and consumer reusable ear plugs? One difference between the two types of reusable ear plugs is the packaging. Industrial reusable ear plugs typically come in boxes of ~100 pairs, in which each pair is individually wrapped in a plastic poly-bag. However, we break bulk for you, so you can get industrial reusable ear plugs in quantities as small as a single pair of ear plugs! By contrast, consumer reusable ear plugs tend to come in retail packaging. The other notable difference between industrial and consumer reusable ear plugs is their intended function (and therefore how complex their design is). Industrial reusable ear plugs are typically designed for general noise protection applications, and while some are corded and some come with carry cases, these ear plugs are all fairly standard. Consumer reusable ear plugs, on the other hand, are most often specifically tailored for a specific purpose. 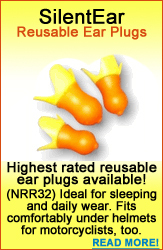 Some consumer reusable ear plugs are intended for swimming and water ear protection; others provide natural sound noise blocking for musicians; and still others are designed to mitigate pressure while flying, block out snoring, kill wind noise while riding a motorcycle, or even specifically block impact noises like gunshots! What are reusable ear plugs made out of? Different ear plugs are made out of different materials. Commonly used materials include pre-molded silicone rubber, vinyl, and other hypoallergenic synthetic rubbers. Some reusable ear plugs are even made of foam! (This is interesting because the vast majority of foam ear plugs are single-use, disposable ear plugs meant to be worn only once.) Note, however, that any foam ear plug that is reusable will be listed here in our store as a reusable ear plug; these unusual reusable foam ear plugs feature a special skin that protects the inner foam material and extends the lifespan of the plugs. What is a flange? Do I need flanges? How many flanges do I need?! The majority of reusable ear plugs have flanges -- flexible ridges or flaps that circle the center of the plug. Flanges help a reusable ear plug seal against your ear canal. Some flanges are very soft and thin (these tend to be larger, and sort of lay down in a smoother cone shape), while other flanges are firmer (these are usually smaller, and stick straight out from the body of the ear plug like little ridges). Most reusable ear plugs have 3-4 flanges. A larger number of flanges does sometimes help create a better acoustic seal, but in general, the number and type of flanges is not related to how effective the ear plug is, or even necessarily how well the ear plug will fit your unique ears. Each model of reusable ear plug is a little different -- some have 3 flanges, some have 4, and some don't have any flanges at all -- but they all provide their rated NRR if they're worn properly. So don't stress about the flanges! What is a corded reusable ear plug? Some reusable ear plugs are corded ear plugs. This is what it sounds like: a cord connects the ear plugs together. This makes it possible to hang the ear plugs around your neck in between uses, which is great for situations in which you'll be taking out and re-inserting your ear plugs frequently. Corded ear plugs are also easier to see, and harder to drop and lose. Whether you want corded or uncorded ear plugs is entirely up to you; the cord has no impact on how the ear plugs should be worn, how they work, or how effective they are. If you're looking specifically for a corded/uncorded reusable ear plug, please read the product descriptions carefully to make sure you're ordering the right ear plugs to suit your preference. How do I take care of my reusable ear plugs? How long will they last? Reusable ear plugs are very easy to care for. Your primary concern when it comes to taking care of your reusable plugs is to keep them clean. Each usage will build up ear wax on the ear plugs, particularly underneath those flanges; depending on where you leave them when they're not in your ears, your plugs can also accumulate dust, dirt, etc. When this happens, your reusable ear plugs can simply be gently washed with warm, soapy water, or even wiped down with rubbing alcohol. Reusable ear plugs are pretty resilient, and can stand up to many washes (just don't try to put them in the dishwasher!). A single pair of reusable ear plugs should last anywhere from a couple weeks to several months, depending on the model of ear plug, how often you use it, where and how you store it, and how often you clean it. Of course, nothing lasts forever. If the ear plug becomes deformed, torn, bent, unusually stiff, excessively dirty, discolored, or for any other reason ceases to provide a good seal all the way around the inside of your ear canal, it is time to get a new pair of ear plugs! 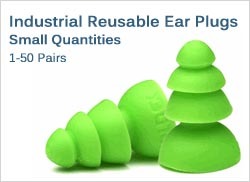 Reusable earplugs offer a better value for industrial customers over time if you can control usage and waste. For consumers, industrial reusable earplugs are a great value, and we do not make you buy a ton of them when you just need a couple of pairs. Reusable ear plugs come in a wide variety of shapes, colors, and styles. Here you will find full boxes of all our industrial reusable ear plugs. Boxes present excellent savings to daily ear plug users and small businesses and organizations. 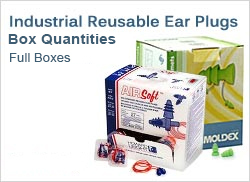 Industrial reusable earplugs in full boxes and case quantities for our very best pricing. 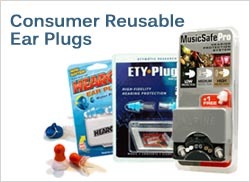 In our consumer reusable earplug department you will find most of the reusable earplugs currently sold in stores in the US plus many specialty earplugs available only in other countries. We import from Europe, Asia, Mexico, and the Middle East to offer what we believe is the largest selection of ear plugs available anywhere.